You are currently browsing the archives for the “News” category. 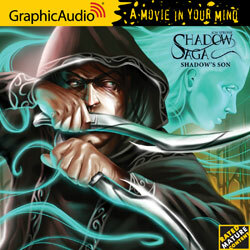 Graphic Audio has all three books of the Shadow Saga on audio (cd or download). If you’ve ever wanted a movie version of these books, this is pretty close. A full cast of voice actors, music, sound effects, and they run 7-8 hours each. According to Goodreads, SHADOW’S SON (my first book), has more than 2600 ratings, 148 text reviews, and is currently being read by 42 people. I know those aren’t “George RR Martin” numbers, but they astonish me. Thank you to everyone who has supported me by buying my books, writing reviews, spreading the word, etc… You’re all awesome. BLOOD AND IRON now has 51 (!) reviews on Goodreads (and 42 on Amazon). Thanks to everyone who has taken the time to help my little book. Yer da bestest!